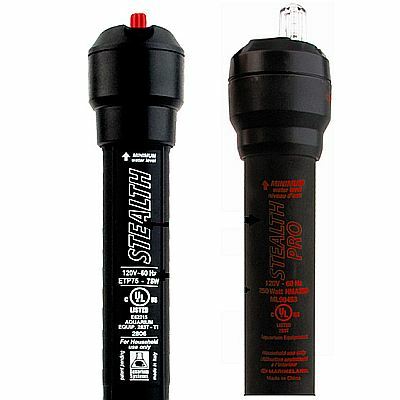 On May 2, 2011 Health Canada recalled the Marineland Stealth and Stealth Pro Aquarium Heaters. This recall involves the following Marineland Stealth and Stealth Pro aquarium heaters. The heaters are black plastic tubes and have a temperature adjustment knob at the top. The model name "Stealth" (in white letters) or "Stealth Pro" (in red letters) is printed on the side of the heater. The model number and the wattage rating are printed below the model name. Stealth Pro heaters were also sold as part of aquarium starter kits. A wiring problem can cause the aquarium heaters to overheat or break during normal use, damaging the aquarium and posing fire and laceration hazards to consumers. Overheating or a break can cause the heater to shatter or the aquarium glass to break. United Pet Group has received two reports of broken aquarium glass in Canada. At time of the recall Health Canada has not received any reports of incidents or injuries to Canadians related to the use of these aquarium heaters. You should immediately stop using the recalled aquarium heaters and contact United Pet Group for a free replacement aquarium heater or a full refund. For additional information, consumers can contact United Pet Group at 1-800-338-4896 between 7:30 a.m. and 5:30 p.m. ET Monday through Friday, or visit the company website. Approximately 37,500 units of the recalled aquarium heaters were sold at pet stores and on various websites in Canada. These recalled products were sold from January 2004 to February 2011. They were manufactured in China and Italy. The distributor is United Pet Group of Cincinnati, Ohio.